Barcelona host Inter in the Champions League on Wednesday night, and while Lionel Messi will be missing, the visitors have serious injury problems of their own. The Argentine icon sustained a fractured arm after an awkward landing during the win over Sevilla at the weekend, and he has since been ruled out of action for three weeks by the Catalan giants. 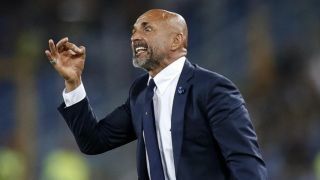 However, coach Ernesto Valverde isn’t the only one with injury headaches, as counterpart Luciano Spalletti will be facing an anxious week or so after the Derby della Madonnina on Sunday night took its toll on his players. As reported by La Gazzetta dello Sport, Radja Nainggolan, Marcelo Brozovic and Ivan Perisic all picked up injuries at the weekend, and coupled with the fact that Roberto Gagliardini isn’t eligible to play in the Champions League, it could leave the Italian tactician severely short of options in midfield. The two sides sit level on six points apiece in Group B, with Inter in fine form across the board having now won seven consecutive games in all competitions. However, those are three key individuals in their side that could be ruled out of action, and so it remains to be seen how Spalletti plugs those gaps with veteran Borja Valero likely to be forced to step in, as he did when replacing Nainggolan against AC Milan at the San Siro. Nevertheless, it’s far from an ideal situation to be in for the Nerazzurri who would have hoped to be at full-strength against Barcelona in such an important encounter as the two sides continue to battle for top spot. Time will tell if they’ve got enough quality and depth in the squad to cope, or if it’s positive for Barca who can certainly take advantage even without Messi.